Rumors have been abound about the Rangers and the Avalanche, as the Rangers have been heavily scouting the Avs recently. Naturally, the thoughts went right to Kevin Hayes, and with good reason. He presents a need for the Avs as a top-six forward to round out their scoring depth beyond that ridiculous top line. The Avs are an interesting team. Outside of that top line, which is carrying them to a playoff spot, the Avs really have no business being in the playoff hunt. Semyon Varlamov started hot, but has cooled recently. About two months ago, I called out the Avs as a team the Rangers should specifically target in trades, since they are a team that has played above their expected results. A team like this can be ripe for the taking. Another thing to note is the Avs have Ottawa’s first rounder this year in addition to their own. That Ottawa first rounder isn’t going anywhere, so don’t bother. But that other one, which could be in the 16-20 range, is a valuable asset. Also not going anywhere in a rental is Cale Makar, but he should be the first ask from Jeff Gorton. It’s not just the Avs that have things the Rangers want (top picks, prospects), it’s the Rangers that have a bunch of things the Avs want. Top six forward rentals? Check (Hayes, Zuccarello). Top six forwards under term? Check (Kreider). Middle six forwards with term? Check (Namestnikov). Bottom six forwards? Check (Strome, Vesey, Fast). Defensive help? Check (everyone). These teams are a clear match. Constructing a theoretical deal is very difficult, because there isn’t just one player we can pinpoint as the Avs target. Instead, we should be eyeing specific pieces outside of draft picks. Martin Kaut (1st, 2018) and Conor Timmins (2nd, 2017) have been mentioned here before. Timmins would be my preference here, as he’s a puck mover with high hockey IQ. He’s something the Rangers lack in the system. He’s not flashy, he doesn’t have elite speed. He’s just solid all around. Kaut is your middle-six, all-around good hockey player. Think Lias Andersson. You can never have enough players/prospects like him. There are other prospects in the system that the Rangers could land, as Kaut and Timmins will be hard to pry from Colorado outside of a Hayes or Kreider deal. For the sake of this post, let’s assume anything acquired from Ottawa in the Duchene deal (Kamenev, Bowers) isn’t on the table. It’s not the best assumption, but there’s logic in thinking a team won’t trade a prospect they just acquired, unless it’s of the Tony DeAngelo mold. With that, we are left with Nikolai Kovalenko (6th, 2018), a playmaking forward with great hockey IQ; Igor Shvyrev (5th, 2017), a raw and skilled forward that needs to put it together, meaning he could be high-risk, high-reward; Ty Lewis (UDFA), a small and nothing overly elite forward that just does everything else well; and Sampo Ranta (3rd, 2018), a pure athlete that is a project, but again a high-risk, high-reward player. There’s a deal to be made between these two clubs. Assuming this is a pure rental deal, we should be expecting a decent-to-good prospect and a good draft pick. The better the player, the more the cost (naturally). It will be interesting to see how this all plays out. "Exploring Colorado as a trade partner", 5 out of 5 based on 6 ratings. Here is my opinion on this Hayes situation. Hayes wants to stay here..I’m all for the rebuild, but I also do not want to give players away for nothing….If Panarin seriously wants to play with NYR as some sources have stated….then let’s keep Hayes…..Sign Panarin…we have Kratsov coming next season…..upgrade the D….Sign Trouba…subtract Shatty….Smith…..pipedream? Maybe, but I do not want to give Hayes away for nothing….We either pry top prospects for Hayes or we go to plan A+…..
100% agree. If Hayes goes, it needs to be a sure thing return (or as close as that ever is in a sport where injuries loom large of course) for Gorton. Not another “meh, looks pretty even” quantity over quality return, and not another deal with ho-hum vets for some reason coming back in it. Home. Run. Top half of the first round pick, legit A level (and preferably projected to be ready next year) prospect coming back. If not, pay the man. Hayes can absolutely be a huge part of the rebuild, whether or not it takes two years or four. There is one pivot on this team who is better than Hayes, at putting up points anyway (and that pivot should probably actually be a winger given his skill set, but I digress). Chytil may not even be a C. Howden probably isn’t going to be much more than a solid 3C/lower tier 2C. Andersson may not be as much or much more than Howden. Etc. The Avs need depth up front but they, the Oilers lack a solid back end. That is also what the Rangers lack and need to address. So hopefully the Avs GM is going for the now and will accept Hayes for Cale Makar. His skating abilities are effortless and he reads plays and makes decisions at an NHL level already. He’s a little small at 5’11” and 187 lbs but he can get a little heavier I guess. At 20 years old I don’t think he’s getting any taller. I think his talent level will make him a 1RD and he will be a stud 50 pt defenseman. The kid Cale Makar that is a Colorado unsigned prospect. He is just what the Rangers need imo. So your saying the Gm has put us in a good position to make a move for some game changers. I am devastated Pete Chiarelli was fired before we could do a deal with Edmonton. We just lost our best chance at acquiring elite talent for peanuts. I agree Colorado makes a good trade partner. But I think they may also not being willing to part with much to make the playoffs this year. They are only 3 points ahead of us in the standings. As you point out they have one great line. So so D and OK goal tending which has not improved as the season has progressed. When you look at their road ahead for them to the Cup, it does not make sense to part with any good assets unless they have some assurances of resigning the players they acquire. If they could sign Hayes right away ok, maybe they are in on a first and a prospect(but not Makar or Kaut). But they are still a few years away from competing too. Dave, unless I am failing to see something, I am not sure that the possible trades are enough for guys like Hayes or Kreider. I’d rather keep them and build around them if that is all they might garner on the market. Now, players like Zucc or Namestnikov are a different story. I could see the Avs having something of value to offer for them. You only trade Kreider for Ottawa’s first rounder. ONLY! Disagree, if the Avs somehow offered their own #1 and Makar, then you drive Kreider to the airport. The problem is that Makar is off the table because he’s that good. Nope, sorry … if we can’t pry their top prospect or that Sens’ pick then I’m more inclined to just trade Zucc to a contender willing to give me a 1st rounder and Namestnikov for a 2nd rounder while keeping Hayes and Kreider. Hayes and Kreider are sure things and still young enough to participate in the rebuild, we’ve nurtured them and went through all the growing pains. Obviously both are blossoming under Quinn, let them lead the team along with Mika up front. We can always trade these guys next year or over the summer if need be. The other forward I would consider moving is Vesey. Over the summer we add Kravtsov and Lias — maybe a Panarin or a Stone … I’m more worried about how we retool the D, whether we can trade Shattenkirk and/or Staal … and whether Skjei can step up, etc. The Ranger leadership..and not just Gorton, have a chance to close this rebuild gap during the off-season…..The key IMO, will be if we can add a J.Trouba or type D man and possibly another……We can upgrade the offense all we want, but if we come back to the same $4,000 finger lakes claimer horses on D, we will once again struggle just to make the playoffs next season. At a minimum I would want the Sen’s pick for Kreider, in the alternative someone would have to offer a sure fire Grade A prospect not a prsopect with ANY question marks. Otherwise I would just wait for the summer or next year. In 99.9% of the possible trades out there for Kreider, the value coming back does not match his current (and near term) value to the Rangers. It would take high picks and prizes like Makar, prospects on that level, who are not available. I actually think Colorado SHOULD BE a poor trading partner. They are a young team that is not really a contender to win it all and it would be foolish for them to compromise the future for the present. So, for example, they would be crazy to give up youth or draft choices for Zuccarello. The only players that should interest them are guys who can be factor for several years, i.e., the kind of players the Rangers can actually use going forward. 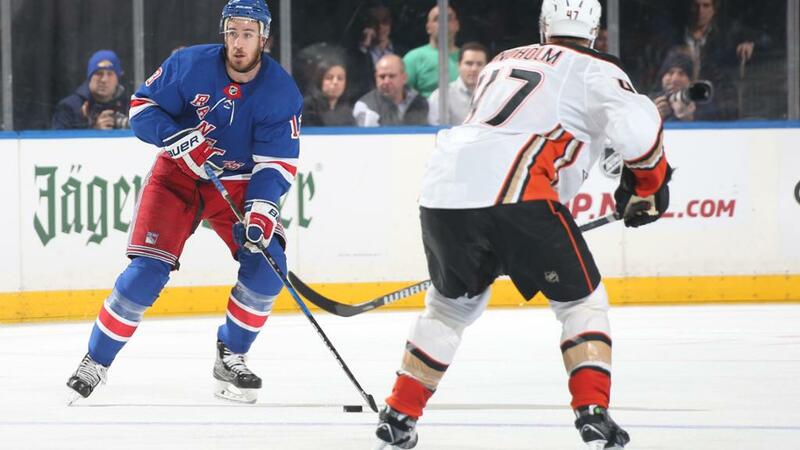 Now I am not saying that trading for Kevin Hayes would be a mistake – and we may yet see that, but what the Rangers have to offer that they should want is very limited. If the concept is that Colorado is unwilling to trade us a top quality prospect in Kaut or Makar then move on to another team. Thank them for their time and willingness to chat. We need quality. High quality. Acquiring another draft pick that’s 4 years away from being NHL ready is not what this team needs right now. So I could give two s**ts about yet another draft pick. Acquiring young NHL ready talent means competing in two years. Acquiring more draft picks means the Rangers might be competing in 5 years. The Bread man isn’t coming here to play without a supporting cast of players. Nor is any other elite UFA. So trading Krieder needs to bring a much larger return then Nash did. If not, you can’t have him. Since we’re in such absolutely dire need of wingers in the pipeline – anything short of a that young top prospect is dumb. just pure dumb. Brooks is spot on. As for Hayes, well, we just drafted two centers. Acquired another. moved some to the wings. He has to go to allow for the growth of these investments. Otherwise we run into even more problems down the road. So whatever can be made of trading him now is just for later down the road if the focus is draft picks. But it shouldn’t be. I feel terrible every time I read a post from a fan praying for a top 5 selection or more draft picks. They usually follow that up with some ignorant idea that if draft picks are received or a top pick is made then the rebuild wont last as long. Again, Brooks nails this point home again with the Krieder piece yesterday. Yet it still continues. Hope is a wonderful thing. False hope is a weapon against the uninformed, under-educated – dreamers. The draft lottery might be a 1-15 chance (give or take the %) – Well I’m here to tell you that you have a better chance at winning the PowerBall jackpot. We can deal Kreider and Hays and Fast for Colorado’s 2 first round picks. What that does is, it gives Colorado two great lines with one hidden flaw. Fast is the key to reducing the lines greatness and prevents Colorado from becoming good. Colorado will be happy with the new shinny Trojan horse and will actually self destruct, until the coach comes to his senses, they will be out of the playoffs and we get a better pick. As you see AV and BS I mean DQ and most of the fans are hypnotized with how good Fast is. But when you look at the math some people will wake up and smell the Coffey. Sports net at noon stated Oilers as of right now have $72.9 Committed to contract salary for next year . Hayes goes to Avs if we can get a first round pick. That’s our best deal. CK should not be traded. We will not get anything as good in a trade and in my mind his loss greatly affects a minimus offense. I still wouldn’t trade Hayes. he suffered under Av. Didn’t start to blossom until this year. Also he wins faceoffs, something the rest of the team can’t do very well. 6ft 5 talented 2 way centers don’t grow on trees. If another team is interested in Kevin Hayes then they need to come up with a serious proposal. Otherwise, Gorton should say thanks but no thanks and sign the 26 year old pivot. The Rangers haven’t addressed their needs on the blueline, I am not sure how creating a hole at center ice helps this team. I’m starting to think we may need to keep Hayes, at least let others think we want to keep him. I’d move him and Zuc for the Ottawa pick though . Otherwise keep Hayes play him with the bread man next year and try to find a couple of top 4 defense men. I really have no idea how we clean up the blue line. ADA and Skjei are the only ones of the 8 that I’d consider keeping and I’m not sold of those 2. Move Pionk if someone dangles something nice. Maybe we can get something for Shatty but we would not be selling from strength. If we do trade with the AV’s, well at least their second 1st round pick must be included as a starter. Then we look to pad the deal with some top shelf prospects, or turn around and walk away. There are only 2 top centers that are available this trading season. Deuscne, and Hayes, and I’d bet the farm that if the Sens don’t re-sign Deusene, he would never go back to the AV’s on his own. Having said that, if the AV’s are for real and want to deal, then they pony up, or get off the pot. There are other teams, and deals to be made, why not hold off to see what other team is interested in Hayes, and get some sort of bidding war going. In so doing, this enhances our organization. Bottom line, there is no rush, we have an entire month to hear from others and see what’s offered!!!!!!! I have gone through this scenario many times, and unless the Avs are willing to trade one of their top 3 prospects, and it appears like they don’t, then I don’t see a trade fit here. Or if there is a trade with them, then we will probably hate it. lol, why Joe? I am for trades, but get scared that the Rangers will pull off underwhelming trades. If the top 3 prospects and the Sens’ pick is off the table for the Avs, which they should be quite honestly, then the Rangers would be settling for a Hayes, or even worse, Kreider trade there. You can trade a player only once. Like in the TB trade last year, the Rangers should have insisted on Sergy, or just walk away. Colorado has to give to get and from your article, there isn’t a lot they will give. I would prefer moving players for a strong prospect, maybe a 2016 or 2017 first round pick.